We apoligize, but as of 01/1/2019 were are running about 16 weeks lead time. We're sorry but due to rising costs our spring prices have changed. 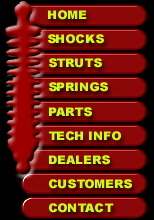 All 2.5" ID springs will be 150.00 a pair and all Stock Front Drag springs will be 210.00 a pair. Thanks for your understanding. We here at Santhuff's are very busy right now so if your having a hard time reaching us by phone please email: Santhuff@gtek.biz or try texting 361-960-1395. Thanks for your patience.